After eight years of public speculation, message board sleuthing and amateur detective work, Brand New’s fifth studio album is finally a real, tangible thing. Science Fiction surprised us, but it’s not a surprise album, at least not in the 2017 music industry definition of the term. There were no pop-up shops or thirst-heavy viral stunts. Zane Lowe didn’t premiere a song on his Apple Music show and hell, the album isn’t even up on streaming services. It’s been almost four years since Dec. 2013, but there’s a good chance frontman Jesse Lacey still doesn’t really know what “pull a Beyoncé” means. 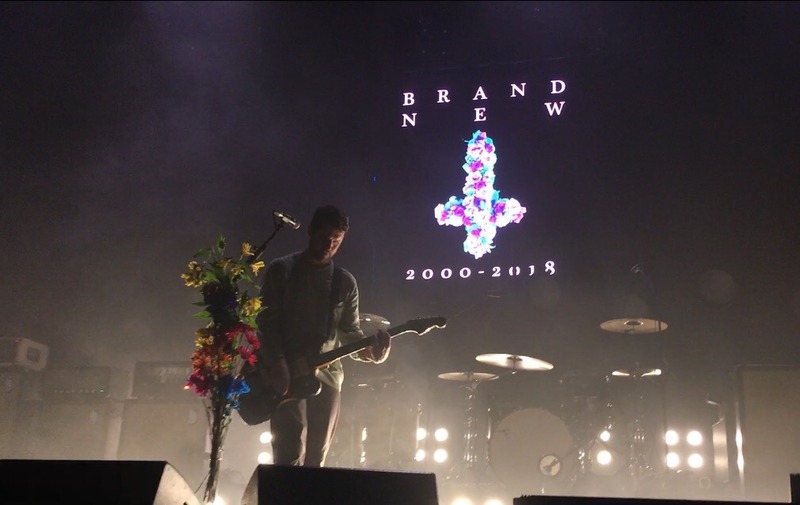 No, Brand New’s straight-to-diehards release plan feels more like a cut from a bygone era, when punk and indie rock fans were connected by home address listings and mail order catalogs, when bands sent out glossy 8X10’s en masse and could write their own mythologies through hokey, half-true one-sheet bios. Still, it feels sincere. The Long Island-bred emo band has never appeared particularly made for this century, from its tendency to scrap songs over Internet leaks to its famously SEO-unfriendly name. Even someone who tried to search for a secondhand “Brand New t-shirt” on eBay in 2001 feels this pain. Lacey once nixed interviews with all major outlets in promoting a new album for fear of clickbait headlines, and this was back in 2006. By sending out initial copies of Science Fiction to a few sight-unseen, paying fans before offering so much as a press release to media types, Brand New isn’t showing off; it’s being the same socially-awkward, not-made-for-these-times cult band it’s always been. Science Fiction was mailed out to those early fans as a singular, hour-long track and that presentation proves apt, even after it was released as a proper 12-song album hours later. It’s a linear monolith, songs intertwined through mystical spoken word segments and found sounds; think the intro to Daisy, but revisited over the course of a record. The first track, “Lit Me Up,” opens like this, with a dated, documentary-style spoken exchange of someone's dream analysis. Static takes over, then droopy, distorted electric guitar, which a woozy Lacey sings over like he's navigating some sort of sonic catacombs: "It lit me up like a torch on a pitch black night." As the dirge plods along, you can sense longtime listeners clenching their jaws, bracing for impact from the massive, out-of-nowhere chorus -- or at least the loud part -- but unlike "Sowing Season (Yeah)," "Bed," "Tommy Gun," and so much of Brand New's catalog before it, the moment never comes. The pay-off arrives with the song's wispy conclusion, and later, when the bass and percussion finally kick in on track two, "Can't Get Out." On this mid-tempo rumbler, Lacey wails his insecurities in the starkest of terms. "I'm just a manic depressive," is particularly gripping, delivered in one of its throbbing, insistent choruses. For nearly two decades, the frontman's lyrics confided via adolescent angst, winking Morrissey pathos, and Biblical imagery; here, the curtain of pretense is pulled away, but Brand New's aura pulls ever stronger. What Brand New does better than anything on Science Fiction is create mood. It's in the weird interludes, the harrowing effects draped on the guitars and Lacey's voice. The singer goes through spine-tingling, high-pitched vocal call-backs on "Desert" and dire, Gregorian chant-like undulations on "Could Never Be Heaven." He even tests the boundaries of his typical overwroughtness with some actual absurdity; at the 2:44 mark on "Same Logic/Teeth," he runs a whole ridiculous line -- "At the bottom of the ocean, fish won't judge you for your faults" -- through a loony, pitch-dropped vocal effect that could pass for a cartoon fish or, in indie rock terms, the most deranged moment of recent-era Modest Mouse. In the middle of an album like this, you're inclined to just go with it. The guitarwork is riveting, too. From all the technique and texture across Science Fiction, it sounds as if half a dozen players cycled through its sessions, rather than the longstanding duo of Lacey and Vincent Accardi. There's the aggro, lockstep groove of "451," the delicate flamenco flourishes over "Desert." The moody expanse of "137" escalates into Mars Volta-ian fretboard mania in its final quarter. But where that band's experimentation led it down an utterly impenetrable path, Brand New's seldom feels noodly or pretentious. The chilling repetition, loud-soft dynamics, and siren wail shred explored ever since Deja Entendu are fully-formed as ever, on an album that actually reflects years worth of obsessive studio tinkering over what most would call a finished product. Somehow, it was all worth it. It's tough to put Science Fiction in immediate comparison with Brand New's older LPs, though fans are undoubtedly already trying. It's better than Daisy, impossible to compare to the pop-punk simplicity of 2001's Your Favorite Weapon, and once it's fully sunk in (which could take another eight years), could be argued as 2003's Deja Entendu and 2006's The Devil and God Are Ragning Inside Me's superior. At the very least, it's the third installment in a trilogy that began with the latter. Devil and God capped off an early-career run of improbable reinventions between albums, after which Brand New could've rightfully changed its name and settled into adulthood, but instead kept the same, paradoxically-appropriate moniker. At this point, they're less a product of the old Long Island pop-punk scene they'll frustratingly always be tied to, but more a part of a lineage of constantly-shape-shifting, steadfastly fascinating experimental rock bands, which famously includes Radiohead, but also the likes of Talk Talk, Swans, the Fall and a disparate many others. From here, the question very quickly shifts to, "What's next?" Brand New has bluntly suggested that 2018 is going to be their final year. If they really are going to stay 18 forever, Science Fiction is a jarring commencement.